No richly adorned caravan enters the domain without your knowledge. As the bold leader of the fiercest bandits in the kingdom, you prepare for another raid with the Scoundrel Leather Greaves safely encasing your lower limbs. Fashioned carefully by hand from 9-10 oz. leather, these armored shin-guards reinforce your defense in battle. This pairs segmented design features leather lacing, antique-brass plated rivets and detailed edging. The three adjustable buckle straps provide a secure fit. 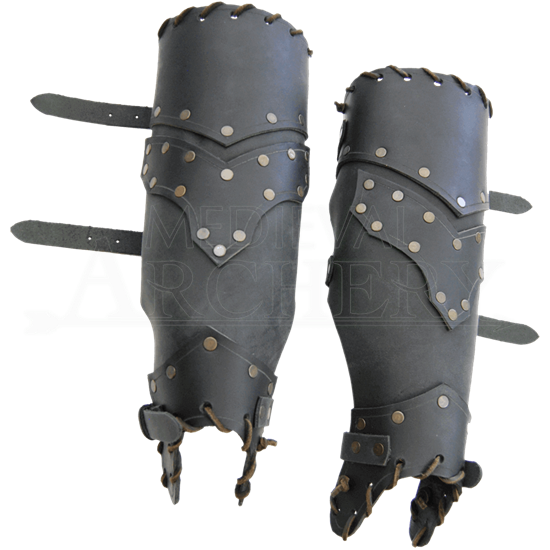 Enjoy the look and feel of these greaves when adding them to your LARP attire.